To Saint Philomena, Nothing is Refused! Here is our little Philomena whom you enquired about the other day. 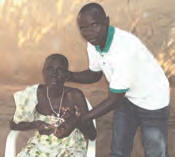 Since birth, she has not had any ailment. She keeps growing healthy and people are asking me, “Mike, what are you giving your baby to eat, what cream and soap do you use on her, etc. ?” It’s not like I have a lot of money to take care of her like some people do but when she stands among other children, she looks different. When it was time for her to walk, she walked and now she has started singing and talking. People can’t stop being amazed. Thank you for accompanying me on this journey; when I needed your prayers right from my wife’s pregnancy, you were there for me; you remember the mother almost lost the baby but for the intercession of St. Philomena and Mother Mary. Philomena is our miracle baby! 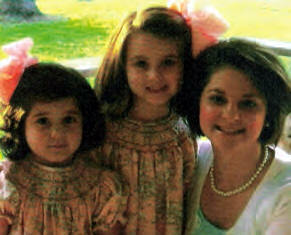 When I had my 6th baby, I had a long hard labor and suffered with a uterine infection. The doctor advised me to have no more children and suggested I have a ligation. I became pregnant with my 7th child last year and my family was very much concerned for my wellbeing. My aunt let me wear her St. Philomena cord during my 8th month of pregnancy and I prayed to this great Saint every day. She heard my prayers. 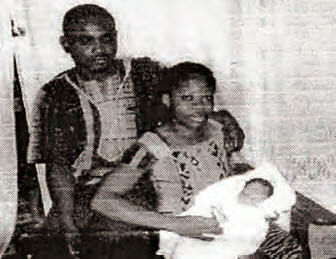 I had a normal delivery and named the baby, Mercedes Philomena in honor of God’s mercy and in thanks to St. Philomena. < Maria – USA > Today, while still in bed, there was a great pressure on my left eye, but suddenly it felt like tangled wires behind the eye being released. It was astonishing. There was also pressure ringing in my ear, which was painful. I placed my Brown Scapular on my ear and my eye and felt an anointing. The loud noise ceased and the pressure vanished. Things felt different. I tried to get up and I got right up without help. I was able to walk without assistance! All praise and thanksgiving to God and His Saints! < Lillian – USA > Thank you for your prayers and the intercession of St. Philomena. My daughter passed the bar exams and is now a full pledged attorney! Praise God! I wrote some time back and asked for prayers for my son to find a job. Thank God and St. Philomena who brought forth this miracle. My son received word, he was to fly out to the cruise ship in Puerto Rico and begin his new job right away. 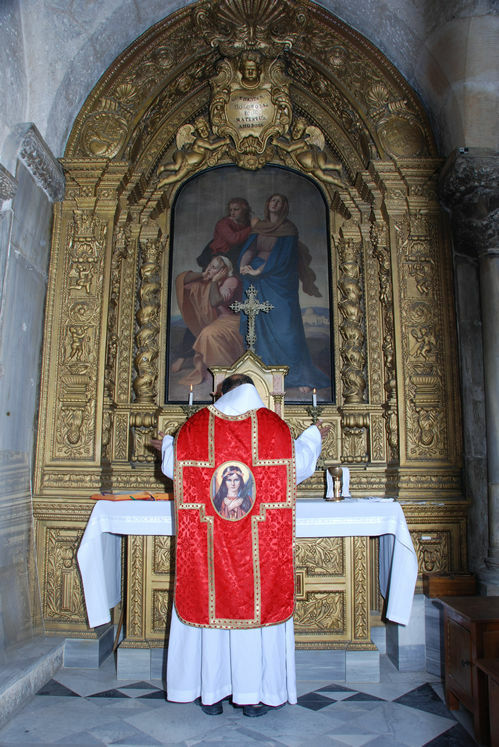 He carried with him the relic card of St. Philomena and is praying to her every day. Forgive my delay in writing as this was due to the wild floods which surrounded our hospital. 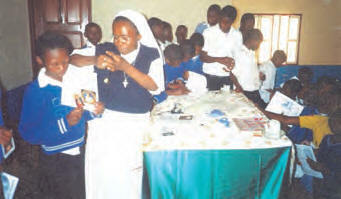 Here is a photo of our orphans who have taken up a Decade in the Living Rosary. 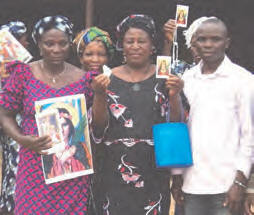 Please send us more Sacramentals and pray for the success of St. Philomena’s Hospital of Fatima here in Benin, Africa. These good people are from Mexico, in the State of Michoacán. 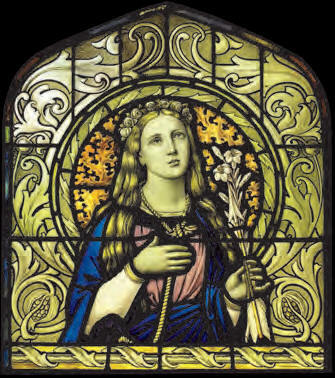 Her brother lost his job and, after going back to ask if there was any way possible to reclaim the job, he was told “Definitely, NO!” He was very discouraged when they were told about the virgin St. Philomena and how powerful she is. 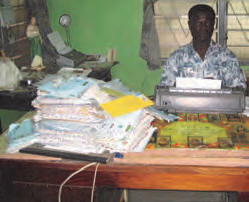 He and his wife began a novena to her with complete confidence and, at the end, he went back to ask for his job back. They gave it to him right there and then! I had a bad inflammation in my legs where screws had been implanted. My diabetes was unstable and I suffered a mild stroke. The doctors said my toes must be amputated. I agreed to the surgery as my fever was high and the inflammation in my feet spread to my whole body. I was in grave danger. Our dear friend, Jeanne Marie, visited me and brought St. Philomena’s healing oil and other devotionals in her honor. He gave me his own cord and a beautiful picture of this Saint. I underwent the surgery and he visited me every day for the next three days, saying that, at the end of that time, St. Philomena would heal me and that my leg would be saved. When the doctor came the next day, he announced that the inflammation was completely gone. Today, my body is healed and my diabetes is under good control. I am at home with my wife and son, who promised to honor St. Philomena for all of their lives. For three years, I suffered terrible pains in my joints, underarms, arms and knees. During this time I went to three doctors, had tests done, and was given sedatives and vitamins. Nothing stopped or lessened the pain. It was as if 1000 needles were driven into my body, to the point where I could get no rest at night. At first, I judged this devotion to St. Philomena to be exaggerated piety, foolish, truly foolish! Today, I am ashamed to admit this. One night when my pains were excruciating, I took the little vial of holy oil and put it all over my body where the pains were so bad. Instantly, I experienced such relief that I fell deeply asleep. The pains ceased as if by magic. But, it was not magic! It was through the grace of God and the intercession of St. Philomena. I stopped taking all my medicine. We visited Paul in Liberia and he told us about St. Philomena. My wife and I had been married for six months and she was having spiritual problems. We made the 54 days Rosary Novena for the intercession of the Immaculate Heart of Mary. We found that she was 3 months pregnant. Her confinement time came and labor was only thirty minutes. Our beautiful baby is named Philomena. We want to share the miracle obtained through the Miraculous Medal. Our blood bath is increasing daily. Last week, close to 200 people were killed by suicide bombers. The miracle was that Zai, a Moslem girl who had accepted the Medal, kept it on her body hidden from everyone. None of her relatives knew she had it. Her family was killed in the bombing, she alone lived! She has promised to wear the Miraculous Medal all her life and is asking me for more. Please pray for her! the Miraculous Medal and anointed herself with the holy oil. She is now expecting a child. I am a patient with hyperthyroidism. I began to use a drop of the holy oil of St. Philomena on my tongue. When I went for my review at the University Hospital, I was told that my thyroid gland was now almost normal! St. Philomena answered our prayers and the application of her oil on my husband’s large toe prevented the need to amputate it! The black skin peeled off and there was new healthy pink skin underneath it. 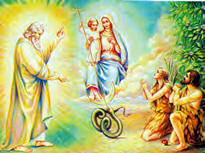 The best news of all is that he has decided to join the Living Rosary! Thanks for all your prayers. Saint Philomena, Invincible Champion of Chastity, Pray for Us, who Have recourse to Thee! In January 2005, my daughter was in her third month of pregnancy for her first child, when she was involved in a 4-vehicle accident on a busy street. Two vehicles hit her from behind and she was so blessed to sustain only moderate injuries. The vehicle she was driving was the smallest one involved. The other two were totaled. To our amazement, her vehicle sustained minimal damage and the left rear corner of the car took the brunt of the impact and on that side, was the bumper sticker, “Ask Saint Philomena – To Philomena nothing is refused!” Here is Myra with Anna Rose who is now 5 years old! I am busy working for the US Senator Rand Paul and he is doing a good job. I believe we need to do more for the Faith. Each and every day, I meet so many people who say they were ‘former’ Catholics. So many care only about material things. So many souls are on the road to Hell. I do what I can but it is not enough. This is why your Dedicated Decades is such an encouragement. To see all these people in so many foreign lands, so hungry for the Faith and so in love with St. Philomena is a great consolation! God bless you! Bon Courage!!! Thank you so much for the beautiful package you sent after the passing of my mother, especially for the Mass card. You sent the most wonderful teachings of our Catholic Faith of anyone I have ever donated to. God bless you! Open to Us, O Mary, The Gates of Paradise Since Thou has its Keys! The Spirit Of Advent is One Of Holy, Expectant Joy! Twenty hundred and eleven years ago, the Divine Redeemer appeared visible and incarnate when He was born a poor human Child in a stable at Bethlehem. But, this first coming of Our Lord occurs again, a merciful reality, not only on the feast of Christmas, but in the hearts of each one of us in the Holy Sacrifice of the Mass. The Church being, as it were, the stable of Bethlehem, and the Altar and our hearts the crib. At Christmas, the Church celebrates not only the first coming of Christ on earth as Our Redeemer, but also the merciful reality of His second coming on earth as our Judge! The day on which the work of Redemption was consummated, is a Triumph for Christ and His followers. By His first coming, Our Lord redeemed us from sin and obtained the resurrection of our souls to the life of Grace. By His second coming, Christ will heal us of all our frailties and will bring resurrection to our bodies. We shall reap the harvest of complete happiness with God even as we have served Him in this world with our whole being, body and soul. It is, then, exceedingly important to prepare our hearts during the Season of Advent for the two-fold coming of Christ: as our Redeemer and also as our Judge on the Last Day. At the great feast of Christmas, now approaching, Christ desires to be born in us that we may live a new, purer and more perfect life through His Grace. We have work to do. There are still countries where people sit in darkness and in the shadow of death; souls in whom Christ, the Sun of Justice, has not yet risen. Let us, during Advent, pray for the redemption of pagan people. Only too numerous, also, are the unbelievers and lukewarm Christians in our own countries, who are deaf to the call of Advent, who do not desire the Redeemer and do not fear Him as their Judge. Let us endeavor to lead these poorest of creatures to Christ and by our prayers, sacrifices and good works make their cold, barren hearts susceptible to the great Grace of Christmas! At the first hour of human sin, God Himself revealed the Woman who would be victorious over Satan. “I will put enmities between thee and the Woman, between thy seed and Her seed; and She shall crush thy head, and thou shalt lie in wait for Her heel." Satan had deceived the first woman, Eve. Through her agency, Adam, our first Parent, fell and with him the whole human race. Disobedience ushered in the reign of death. 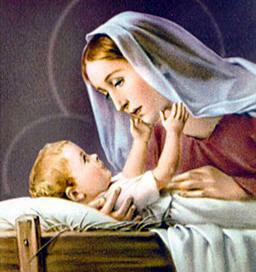 Mary is the sign of hope, given by God to a sinful people. Through Her humble Fiat, She became His Mother and ours. 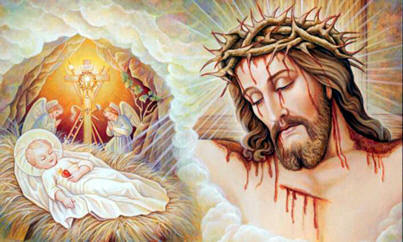 The Son of God, Who exists from all Eternity became, in time, the Son of Mary! Be it done unto me according to thy word." And the Word was made Flesh and dwelt among us. Mary was a Virgin before the Birth of Jesus Christ, a Virgin in His Birth, by a miracle of God, and a Virgin ever after She brought forth Our Saviour: such is the Faith of all the Church since the earliest of times. In considering the glory of the Blessed Virgin, it is perhaps easy to forget the life-long sorrow that was Hers, for She is in fact the Mother of the suffering Redeemer. Our Blessed Mother was gifted with a vast intelligence. No sin had ever clouded Her understanding of the things of God. She knew well the sadness of the prophecies which foretold how the Messiah would take upon Himself the penalties of our sin. We count in our Rosaries, the Annunciation as a Joyful Mystery. The joy, in truth, is ours; we who have through Mary been given a Redeemer. The sorrow is Hers, for She knew that He must be the Man of Sorrows. Simeon confirmed the anguish in Her mother’s soul; the sword pierced Her Heart in that instant. In full submission, Mary had agreed to be His Mother. We can only guess at Her thoughts as She watched the beauty of Her Infant and growing Son. She saw His little Hands and Feet pierced with nails, His face bruised and bleeding, and in His side the brutal opening of the lance. His outstretched arms were already affixed upon the Cross. The closeness of Mary’s union with the atonement of Her Son has won for Our Lady the title which is perhaps the sweetest that a man can use in Her regard: Mother of the Divine Redeemer. There is one Mediator of God and man, Jesus Christ. By His Death, mankind has been redeemed. Yet, in a very real sense, Our Lady by Her satisfaction and Her merits under Christ and in union with the only Saviour, is called Co-Redeemer. At the Incarnation, She gave Her fullest consent to be the Mother of the Crucified Redeemer, with all the martyrdom of soul that such an office could entail. In the Presentation, Mary offered to God a gift such as never before had been given Him. She, it was who cared for the Saviour at every stage of His infancy and His hidden life. To suffer and to live in union with Her Son, summed up Her entire life on earth. She was one in heart with all the thoughts and sentiments of Her Son. She offered Him to God in the Sacrifice on Calvary, with an understanding and a love, which were surpassed in fullness and perfection only by the sacrificial act of the Divine Victim on the Cross. We want to wish all of you a very holy and happy Christmas, filled with the most choice blessings! May your family be warmed and sustained by the furnace of charity which flows through our souls, by the great bond of prayer that unites us the world over! Cherish your family, count your blessings and set up solid spiritual goals for the New Year! One with you in the Pure Heart of Mary! May Mary, the Mother of God, mother Jesus in you, until you no longer are – but He lives and prays through you! This is our vocation as Christians: to again give to Christ, even as Mary did, a body of real flesh (our very own) in which to dwell and operate! This is our glory! This is our calling! Jesus looks to us for another humanity through which He can live again, through which He can again believe, obey and love His Father. This is Our Life: To Let Christ live! We all familiar with the Christmas song, "The Twelve Days of Christmas" To most it's a delightful nonsense rhyme set to music. But it had a quite serious purpose when it was written. It is a good deal more than just a repetitious melody with pretty phrases and a list of strange gifts. The song's gifts are hidden meanings to the teachings of the faith. The "true love" mentioned in the song doesn't refer to an earthly suitor, it refers to God Himself. The "me" who receives the presents refers to every baptized person. The partridge in a pear tree is Jesus Christ, the Son of God. In the song, Christ is symbolically presented as a mother partridge which feigns injury to decoy predators from her helpless nestlings, much in memory of the expression of Christ's sadness over the fate of Jerusalem: "Jerusalem! Jerusalem! How often would I have sheltered thee under my wings, as a hen does her chicks, but thou wouldst not have it so …"
Golden Rings = The first Five Books of the Old Testament, the "Pentateuch", which gives the history of man's fall from grace. Ladies Dancing = the nine Fruits of the Holy Ghost. 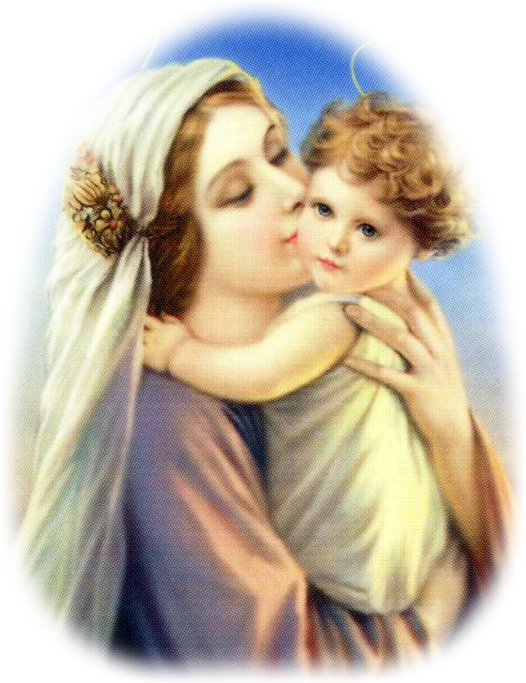 May the baby Jesus remain in your heart and may your tears be that of joy! May St. Michaels’ fighting angels of peace invade your home and drive away all that is ungodly and undesirable! May thieves steal all your debts! May the Archangel Raphael heal all your illnesses, heartaches and physical discomforts of the last years and keep you always healthy! May the angels of love stick to your face like expensive perfume and may laughter assault your lips! May love, peace, joy, good health, success and prosperity be the daily order of your day and may the days that follow be just as blessed! May your problems and heart aches disappear and may future challenges be light as feathers! May your faults be written in the sands and may your good deeds be carved into granite stones! May your soul be free of worldly debris and may your heart be filled with right faith, firm hope and perfect charity! May your Christmas and New Year wishes be answered and may your dreams come true! May our merciful God continue to bless you and may you humbly accept all with heartfelt gratitude! In other words, Merry Christmas! Be assured of my prayers for you and your family for the coming year! ¡El Espíritu de Adviento es Uno de Gozo Piadoso, Expentante! Hace dos mil once años, el Divino Redentor apareció visible y encarnado cuando nació como un Niño pobre en el establo de Belén. Pero, este primer advenimiento de Nuestro Señor ocurre de nuevo, una realidad misericordiosa, no solo en la fiesta de Navidad, sino en los corazones de cada uno de nosotros en el Santo Sacrificio de la Misa. La Iglesia siendo, como si dijéramos, el establo de Belén, y el Altar y nuestros corazones el pesebre. En Navidad, la Iglesia celebra, no solo la primera venida de Cristo a la tierra como Nuestro Redentor, ¡sino también la misericordiosa realidad de Su segunda venida a la tierra como nuestro Juez! El día en el que la obra de Redención fue consumada, es un Triunfo para Cristo y sus seguidores. Por Su primera venida, Nuestro Señor nos redimió del pecado y obtuvo la resurrección de nuestras almas a la vida de Gracia. Por su segunda venida, Cristo nos sanará de nuestras flaquezas y traerá resurrección a nuestros cuerpos. Recogeremos la cosecha de felicidad completa con Dios según como le hayamos servido en este mundo con todo nuestro ser, cuerpo y alma. Es, entonces, sumamente importante preparar nuestros corazones durante la Temporada de Adviento para los dos aspectos de la venida de Cristo: como nuestro Redentor y también como nuestro Juez el Día del Juicio. En la gran fiesta de Navidad, que se acerca, Cristo desea nacer en nosotros para que vivamos de nuevo, por Su Gracia, una vida más pura y más perfecta. Tenemos trabajo por hacer. Todavía hay países donde la gente está en las tinieblas y en la sombra de la muerte; almas en las que Cristo, el Sol de la Justicia, aún no ha salido. Recemos, durante Adviento, por la redención de la gente pagana. Demasiado numerosos, también, son los cristianos incrédulos y tibios en nuestros propios países, que están sordos al llamado de Adviento, quienes no desean al Redentor y no le temen como su Juez. Procuremos guiar a estas creaturas paupérrimas a Cristo y por nuestras oraciones, sacrificios y buenas obras hacer sus corazones fríos y estériles, ¡suceptibles a la gran Gracia de Navidad! ¡AHÍ TIENES A TU MADRE! A la primera hora del pecado humano, Dios Mismo reveló a la Mujer que sería victoriosa sobre Satanás. “Yo pondré enemistades entre ti y la mujer, y entre tu raza y la descendencia suya: ella quebrantará tu cabeza, y tú andarás acechando a su calcañar." Satanás había engañado a la primera mujer, Eva. Por ella, Adán, nuestro primer Padre, cayó, y con él toda la raza humana. La desobediencia lanzó el reino de la muerte. María es la señal de esperanza, dada por Dios a un pueblo pecador. Por su humilde Fiat, ella se convirtió en Su Madre y la nuestra. ¡El Hijo de Dios, que existe desde toda la Eternidad se convirtió, en el tiempo, en el Hijo de María! Hágase en mí según tu palabra." Y el Verbo se hizo Carne y habitó entre nosotros. María fue Virgen antes del Nacimiento de Jesucristo, Virgen en Su Nacimiento, por un milagro de Dios, y siempre Virgen después de dar a luz a Ntro. Salvador: tal es la Fe de toda la Iglesia desde los primeros tiempos. En consideración a la Gloria de la Santísima Virgen, quizá sea fácil olvidar el sufrimiento de toda su vida, porque ella es de hecho la Madre del Redentor doloroso. Ntra. Santísima Madre fue dotada de una vasta inteligencia. Ningún pecado jamás había empañado su entendimiento de las cosas de Dios. Ella bien supo la tristeza de las profecías que predijeron cómo el Mesías tomaría sobre sí las penalidades por nuestro pecado. En nuestros Rosarios, contamos la Anunciación como un Misterio Gozoso. El gozo, en verdad, es nuestro; nosotros a quienes les ha sido dado por medio de María un Redentor. El dolor es de ella, puesto que ella sabía que Él debía ser el Varón de Dolores. Simeón confirmó la angustia en su alma de Madre; la espada traspasó su Corazón en ese instante. En completa sumisión, María había accedido a ser Su Madre. Solo podemos imaginar sus pensamientos al observar la belleza de su Hijo, de Niño y durante su crecimiento. Vio sus manitas y pies atravesados por los clavos, su rostro amoratado y sangrando, y en su costado la abierta brutal de la lanza. Sus brazos extendidos ya estaban fijos en la Cruz. La estrechez de la unión de María con el desagravio de su Hijo ha ganado para Nuestra Señora el título que quizá sea el más dulce que un hombre pueda usar con respecto a ella: Madre del Divino Redentor. Hay un Mediador entre Dios y el hombre, Jesucristo. Por Su Muerte, el hombre ha sido redimido. Sin embargo, en un sentido muy real, Nuestra Señora por su satisfacción y sus méritos bajo Cristo y en unión con el único Salvador, es llamada Corredentora. En la Encarnación, ella dio su completo consentimiento para ser la Madre del Redentor Crucificado, con todo el martirio de alma que tal oficio pudiera acarrear. En la Presentación, María ofreció a Dios un don tal como jamás antes le había sido dado. Fue ella quien cuidó al Salvador a cada etapa de Su infancia y Su vida oculta. Sufrir y vivir en unión con su Hijo resumió su vida entera en la tierra. Ella de corazón fue una con todos los pensamientos y sentimientos de su Hijo. Ella lo ofreció a Dios en el Calvario, con un entendimiento y un amor, que fueron sobrepasados en plenitud y perfección solo por el acto expiatorio de la Divina Víctima en la Cruz. ¡Queremos desearles a todos ustedes una muy bendita y feliz Navidad, llena de las mejores bendiciones! ¡Que su familia sea calentada y sostenida por la hoguera de caridad que fluye por nuestras almas, por el gran vínculo de oración que nos une por todo el mundo! ¡atesoren a su familia, cuenten sus bendiciones y preparen metas espirituales sólidas para el Nuevo Año! Uno con ustedes en el Corazón Puro de María! Que María, la Madre de Dios, críe a Jesús en ti, hasta que tú ya no seas – ¡sino Él que vive y reza a través de ti! Esta es nuestra vocación como cristianos: dar de nuevo a Cristo, como María lo hizo, un cuerpo de carne real (el nuestro propio) ¡en el que more y opere! ¡Esta es nuestra gloria! ¡Este es nuestro llamado! Jesús nos busca para otra humanidad por la que Él pueda vivir otra vez, por la que Él pueda otra vez creer, obedecer y amar a Su Padre. ESTA ES NTRA. VIDA: ¡DEJAR QUE CRISTO VIVA! 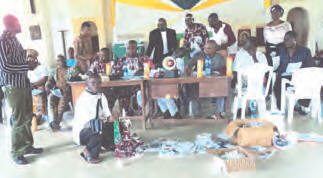 Dear Friends, Cordial greetings from the new Catholic Diocese of Bo in Southern Sierra Leone! I have been in touch with Ms. Juliana Tommy. I acknowledge and appreciate the spiritual work she is engaged in, that is, of promoting the praying of the Rosary in our country which is largely Moslem. I would like to express my gratitude to you and your organization for the gifts of Rosaries, Chalice, Holy Oils, etc. that I received from Juliana after my Episcopal Ordination on 7th May this year. 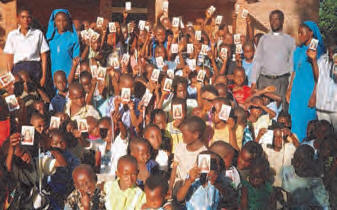 Our diocese is the newest and youngest in Sierra Leone. We hope to build it up on a very solid spiritual foundation. We, therefore, kindly ask you to keep us in your prayers and help us form the people of God in this new diocese in deep spirituality. May Mary, Our Mother, Help of Christians, pray for us all! Thank you so much for the package you sent me. St. Philomena’s cord is unbelievable! l wear it all the time. It is like my own umbilical cord that connected me to my mother! I am overjoyed with it. It is part of me now and will be forever! I have been a member from 2003 and my wife joined in 2008. Thank you for your magazine, Dedicated Decades, we both read it throughout. The spirituality of the essays deepen our faith, while the accounts of the miraculous interventions of St. Philomena and the courageous efforts of Catholics in third world countries, increase our devotion. We are sending our annual donation. Thank you so much for your parcel. May God reward you 100-fold! Great numbers have benefited. I encourage all my students to enroll in the Universal Living Rosary Association of Saint Philomena (ULRA). We pray for all of you and we thank you! I treasure everything you send, for it gives strength to our people. Thank you for your gift of Rosaries. Today, we have many faithful who come to pray the Rosary. They live under the firm confidence in Mary and the power of the Mysteries. Countless numbers convert. The simplicity of this devotion makes it perfect for children and persons of every walk in life. Forgive my delay to send my thanks along to you. I work alone as Prior of our Dominican Mother House, Director of a school and representative of the Dominican Order in Quito. When I distribute the Rosaries you send to our people, before we begin the Holy Rosary, we pray for you first. I mailed you 720 members and here is another photo of new members from the Madeleine Academy and our feast day celebrations for St. Philomena. Your FOREX boxes are such a support for the spread of this devotion among the suffering and poor. God bless us all! We gather all our youths for 2 weeks out of the year and we invite speakers, resource people from the Church and government, to give guidelines to the youth. During this time, we have sports activities, Bible studies, the Rosary and Eucharistic Adoration, fund raising and a social night. We are happy to learn about your Youth for Purity Crusade and are eager to be a part of this work. I greet you on the Eve of St. Patrick’s Feast. May St. Patrick along with St. Philomena bring you and all your staff many graces and blessings! I am hoping you can send me some medals of St. Philomena. I work as a hospital chaplain and give out the medals. I place the children under her care. Prayers are answered in abundance! I know she is a powerful Saint. Also, I place couples who have suffered miscarriages under her protection to help them conceive. May God reward you! Thank you for accepting our sincere request to join full membership in the ULRA. Many will be willing to join the group. I enclose a photo of our new members. We appreciate your concern for us and pray that this communion may shine forth toward accomplishing the desired mission before us, which is the salvation of the whole world. I have enrolled these young seminarians in the ULRA. I could not include everyone as many were writing their exams. Please, we need more materials for the large number of new members. I am officially continuing to assist the youth in our parish to take part in the Universal Living Rosary Association of Saint Philomena (ULRA). 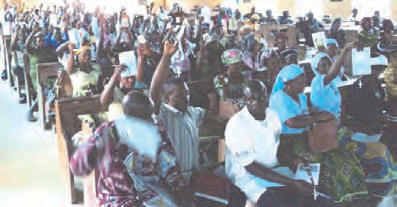 It is my hope that youhave received the enrollment forms I sent and more materials will be coming to us. 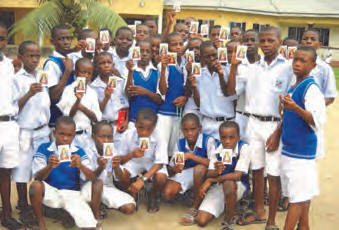 I am sharing photos of the youth just enrolled. The young generation and our whole community wish to be involved in the ULRA. Folks from distant villages want to take part. Please send us more materials to help spread the devotion. God bless all of you! Please find 26 completed forms for membership. We are patiently waiting for more Rosaries. We thank God for the good works you do in His Name. I thank you and all your members for your tireless support of my missionary work by providing Sacramentals. We are very grateful as it is an important part of what we do here at the Shrine of the Sacred Heart of Jesus through the Heart of Mary. 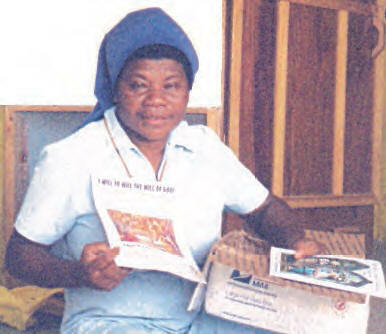 Thank you for the Rosaries, Medals and all the materials you send. Our ULRA groups are growing in great numbers not only in this parish but also in other parishes the priests invite me to share with them the life of St. Philomena. The bishop has invited me to teach the people about the Universal Living Rosary Association of Saint Philomena (ULRA) and St. Philomena. We pray for all of you. 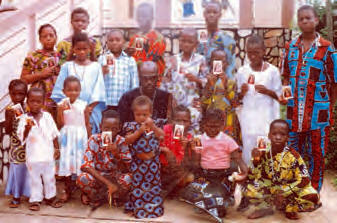 I am sending you some pictures taken at the Sacred Heart Catholic Church, Abuja, Nigeria where many people were assigned a Decade. There was a lot of publicity so people from other parishes and dioceses came. In fact, all the presidents from other churches helped set up a superb meeting, as for the very first time we had something to eat and drink for they were really happy with the Universal Living Rosary Association of Saint Philomena (ULRA) for the good work it is doing in spreading the devotion to the Blessed Virgin Mary. After Mass, the parish priest, in his message, conveyed his happiness with what we were doing and encouraged us to do more to reach out to other people who are in dire need of our united prayer. He has worked in many places but has not come across any society that is doing this much in spreading the devotion of Mary. 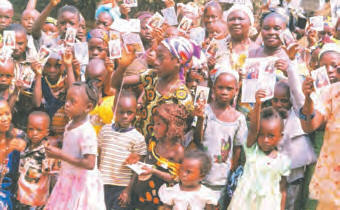 I visited the HIV-AIDs victims. 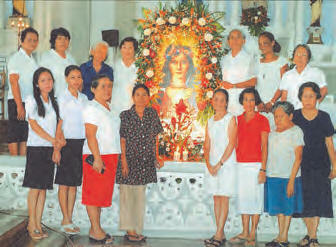 They are all happy to be a part of the Universal Living Rosary Association of Saint Philomena (ULRA). Our people have little money to buy books or Sacramentals. 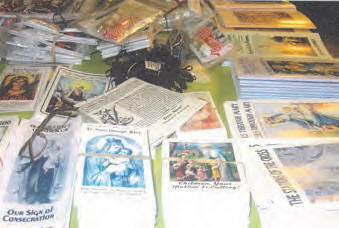 We thank you very much for all the spiritual treasures you send for our members in Romania. 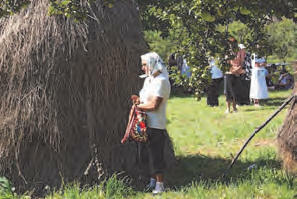 This is Transylvania where we still continue to have Holy Mass under the burning sun, and confessions in make-shift confessionals. It is with great pleasure I wish to report my visit to Sri Lanka along with our Spiritual Director, Fr. 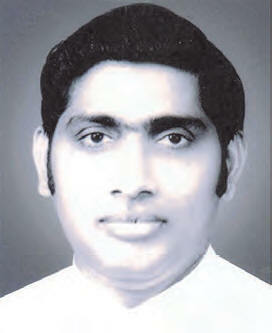 Prasad Ignatius (who was appointed by our Archbishop, Most Rev. A.M. Chinnappa) from July 29 to August 1, 2011. Fr. Andrew Uthayadas, Animator of Sri Lanka organized a Universal Living Rosary Association of Saint Philomena (ULRA) Rally on 30th July. 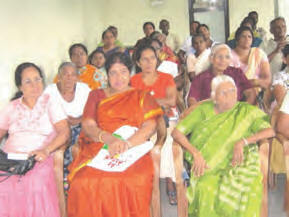 About 150 members participated. The role of Our Lady in the Salvation of mankind and the Children of Mary’s cooperation in the Triumph of Her Immaculate Heart was the theme of our Spiritual Director’s talk to the members. On August 1, we met Most Rev. Malcolm Ranjith, Cardinal and Archbishop of Sri Lanka and discussed about the ULRA functioning in our country and recommended the petition of Fr. 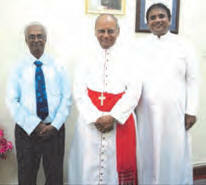 Andrew, Animator of Sri Lanka for the appointment of a National Spiritual Director. The Cardinal was happy to appoint Fr. 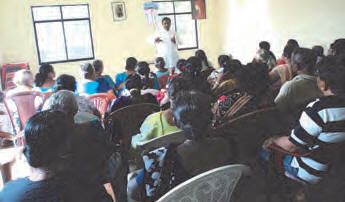 Prasad Ignatius as the Spiritual Director of the Universal Living Rosary Association of Saint Philomena (ULRA) in Sri Lanka and he is very supportive in spreading the devotion of the ULRA in the country. It was a fruitful and worthy meeting. The prayers and reflections during the Rally were conducted in the local dialect, Sinhala and in Tamil, followed by Eucharistic benediction. Brother Joseph Roche and his Indian Spiritual Director, Fr. Prasad Ignatius, had boosted the program. 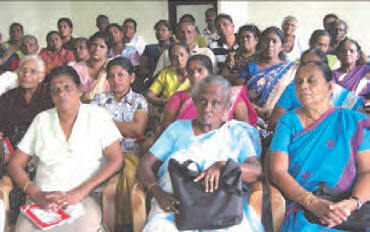 The success of the ULRA Rally in Sri Lanka is due to the constant love and support of our ULRA Director, Patti Melvin. We thank you, dear Benefactors, for helping us spread the Universal Living Rosary Association of Saint Philomena (ULRA) in Sri Lanka. We keep you in our prayers and in the Sacred Masses too. I and my family wish to enroll in the Universal Living Rosary Association of Saint Philomena (ULRA). We are interested and happy to follow your instructions, and guidelines, so that peace and harmony may come to our communities. We are all happy to become soldiers in Mary’s Holy Rosary. 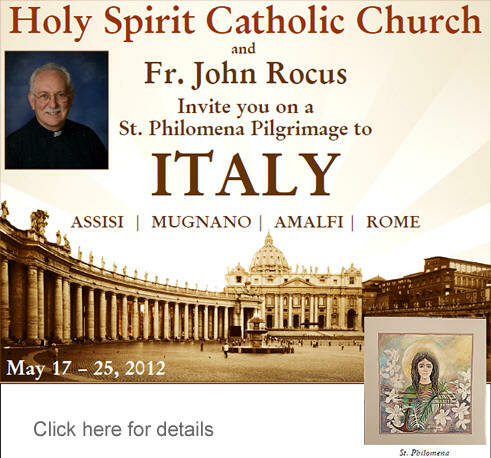 I am requesting for Rosaries and the holy oil of St. Philomena. Everyone loves this dear Saint, whose rope and oil are healing the sick, driving the devil out of those possessed and strengthening every one spiritually. 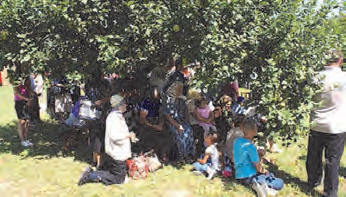 A group of about 20 families meet every Sunday, pray the Rosary, have a Bible study and carry out social activities. I had 30 candidates for First Communion. Please send us anything you can. The demand is just great. I failed to reply and inform you about what is going on. The people in our parish badly need the sacred materials you send out to teach and strengthen the Faith. The youth turn to drugs and homebrew alcohol. This creates lots of problems in the family and society as a whole. All who call upon St. Philomena are helped. Thank you. We await your parcel! 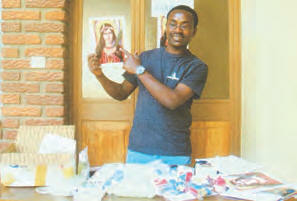 I am a seminarian and the animator of the Pontifical Missionary Childhood Group here in Port Moresby. 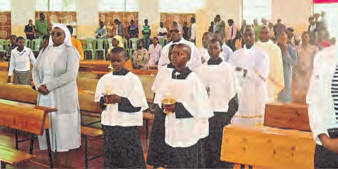 We have 40 consecrated children who have committed themselves to the service of the Church and to the world. 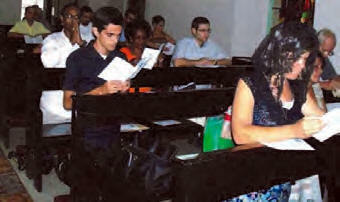 We have many programs that help us to be missionaries. I hope you can send for them, little pictures of St. Philomena, oils, Rosaries and Medals which will bolster their spirits to seek after the things of Heaven. We will keep in touch with you in our prayers under the guidance of St. Philomena. 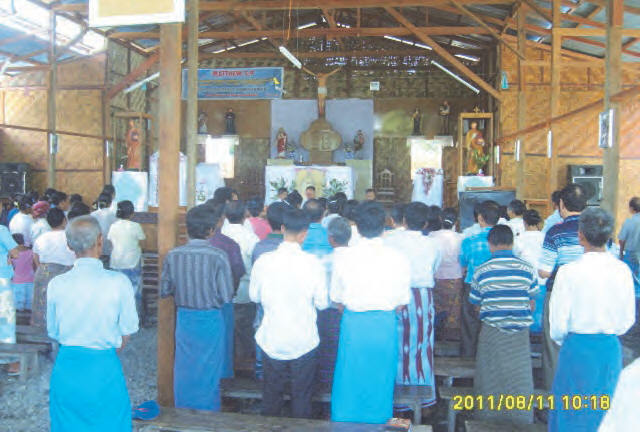 St. Philomena’s holy oil has cured many people in Yabob Village, Madang. Please, I beg for more. I am so glad to receive your spiritual gifts, reading materials, booklets and literature which encourage, inspire and enrich me and to share these with my people. Thanks a lot, not only for the gifts, but also for your support, care and prayer during my vocation crisis and, above all, for your love and faith. Wishing you a Happy Feast of Saint Philomena! I am very proud to tell you that the celebration of Saint Philomena’s Feast was successful. 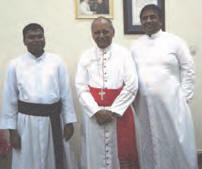 We four priests (Kaly, Vicar Forane – Fr. 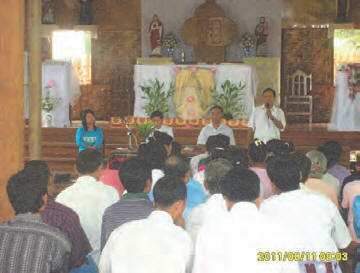 Jerome as main celebrant) offered High Mass at 8 a.m. and there were about 200 faithful. Soon after Mass, we had a meeting. One girl, Helena Tee gave witness to the power of the Rosary and Infant Jesus. She recites 1,000 Decades a day. She casts out devils from those who are possessed through the power of the Holy Rosary, holy water, and holy oil and cord of St. Philomena. 26 lay persons promised to say one Rosary every day. I need more Decade numbers for enrollment. Please send me Rosaries, Scapulars, Miraculous Medals, holy oil and cords of St. Philomena as soon as possible for another list of members. I have already mailed the lists of new members. How about our proposal to build a chapel for St. Philomena? Here are the photos of our activities. 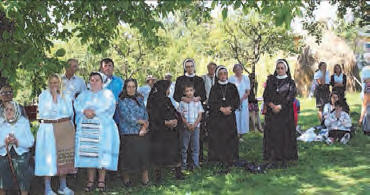 I was invited to launch the Universal Living Rosary Association of Saint Philomena (ULRA) in village Kologory, located in Lviv near the mountain. The people learned about the strength of the ULRA spirituality and invited me to form the LR group. All the village folks came to church for the Sacred Mass in honor of St. Philomena and the youth performed a concert which was dedicated to the Saint. 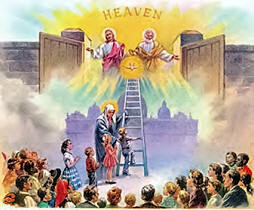 Everybody was moved to learn how St. Philomena offered her life for Jesus Christ. 30 children participated in the performance and almost 100 faithful were present at the Sacred Mass along with members of Universal Living Rosary Association of Saint Philomena (ULRA) from village Kologory. Please pray for the repose of soul of Father James. 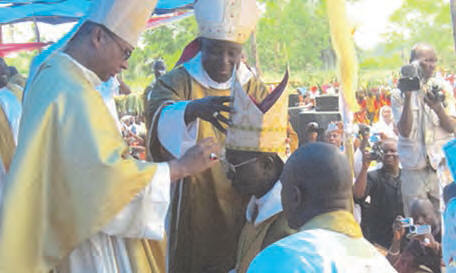 Archbishop Thazhath continues his Decade in the ULRA. Dear Leader, Associates, Friends and Benefactors of the Universal Universal Living Rosary Association of Saint Philomena (ULRA) Association, Thanks for the Rosaries and religious articles! I am very happy to receive the packet containing a Crucifix, Rosaries, poster pictures of Our Lady of the Rosary and the Way of the Cross, and leaflets. I am also happy to understand that you have included my classmate, Fr. James Parokkaran (RIP), in your prayers. 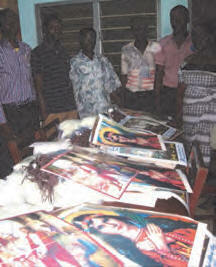 I am distributing the Rosaries and poster pictures to our faithful who are really devotees of Our Lady. I am very happy to have the DVD on the Eucharist. I am one with you in prayer that through the example of St. Philomena, every family may cultivate a great love and devotion to the Eucharist and the Blessed Mother! I am so grateful to receive materials from your Association. Fr. Prof. John Appiah Poku, on my left, is a Senior Lecturer, School of Medical Science, University of Science & Technology, Kumasi and on my right is Fr. 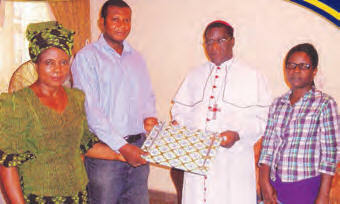 Dr. Augustine Ntim Duodu, Vice Rector of St. Joseph’s Catholic Seminary, Mampong. 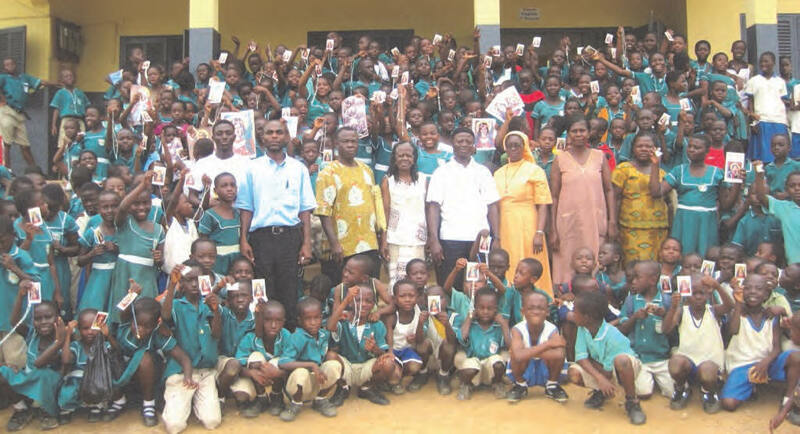 They are very well recognized as the Spiritual Directors of the ULRA in Ghana, after Archbishop Emeritus Dr. Peter Sarpong and are very active and much supportive to the work of the Universal Living Rosary Association of Saint Philomena (ULRA). They try always to travel from their various destinations to celebrate the Mass of St. Philomena with us on every feast day of the Saint at our St. Peter’s Cathedral Basilica. This they have done for over the past 20 years now. They say, they deserve NO recommendation from anyone as they do all because St. Philomena is their own beloved Sister who intercedes for and refuses them NOTHING they ask through her intercession. Patti, you can see both our good Priest members at the Altar offering the Mass of St. Philomena during her last feast on May 25, 2011. During the 1990’s, both Fathers John and Augustine use to accompany our Preaching Team for some weekend trips to other Parishes and that was so very encouraging but, nowadays, due to their heavy schedules, they cannot continue. 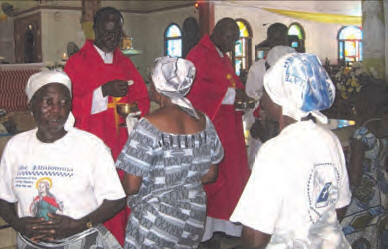 In fact, they have done a lot for the fast spreading of the ULRA devotion here in Ghana more than any other Priest in the country. They do much to inspire me in the Universal Living Rosary Association of Saint Philomena (ULRA) work in Ghana and other places. Moreover, they have taken the responsibility to celebrate Holy Masses for the special intentions of the ULRA, both spiritual and temporal. They love Our Lady, the Rosary, ULRA and St. Philomena as well as you, Patti and me! You and your wonderful Apostolate are always in their hearts. 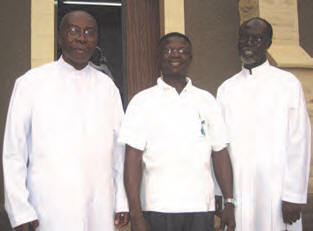 Many people call them Saint Philomena’s Brothers in Ghana, as I am also called Anthony Philomena. Let us continue to keep them in our daily prayers. You may see how the work is been done at our Center. Michael, Sylvester and Gabriel are so busy at typing the enrollments and filling out Decade Cards for new members. You can see how we sort out / arrange devotional items for making the packages. You may see, after packaging, how we try to decorate the packages or boxes and address label them for mailing. 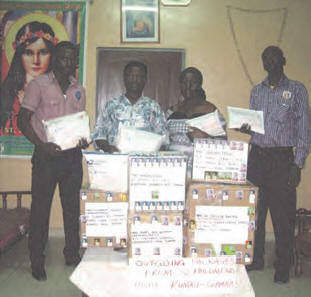 We finally pack them into the St. Philomena’s van, and then to the Post Office for special mailing. So sorry, the little camera I use cannot capture indoor pictures clearly. You may see me behind a lot of boxes in my office at the St. Philomena’s House! One of the schools, we had the privilege to visit last month was the Martyrs of Uganda Jubilee School at Odeneho-Kwadaso. We talked much about Purity to the students who are already members of the ULRA. 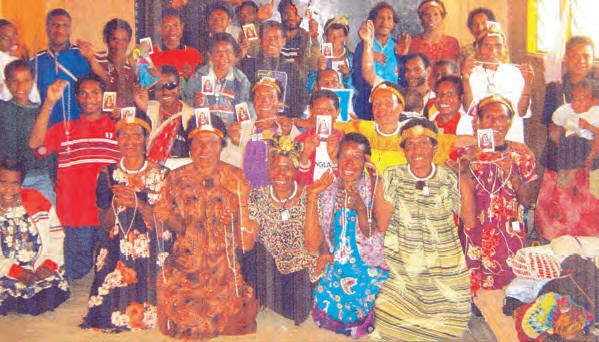 You can see Sr. Cecilia Salifu, headmistress with some of the staff members in the group photograph. Most Rev. 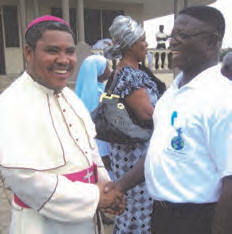 Peter Paul Angkyier, the Catholic Bishop of Damongo Diocese in the Northern Region of Ghana giving me a warm welcome. Thank you, dear Benefactors and Patti, for all the love and support to the Universal Living Rosary Association of Saint Philomena (ULRA) Center in Ghana. You are currently browsing the Universal Living Rosary Association of Saint Philomena (ULRA) blog archives for December, 2011.